COTABATO (Updated) -- A magnitude 5.7 earthquake rocked Mindanao at 10:10 p.m. Saturday, the Philippine Institute of Volcanology and Seismology (Phivolcs) reported. The Phivolcs located the epicenter of the earthquake at 12 kilometers northeast of Carmen, North Cotabato province. Two aftershocks, measured at magnitude 4.3, struck the same location at 10:40 p.m. and 10:45 p.m. Saturday, the Phivolcs added. 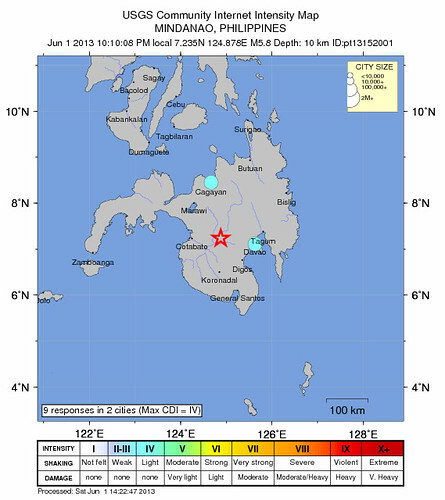 The tremor, which is tectonic in origin, was also felt in several parts of Mindanao. Intensity IV was felt in Matalam, North Cotabato; Intensity III in the cities of Tacurong, Marawi, Kidapawan, and Cotabato; while Intensity II quake was recorded in the cities of Davao and Valencia, including in Polanco, Zamboanga del Norte.